Last week I delved into what it means to Be You as it applies to my life and living. And I played with this concept of Indulgence. Sometimes what we don’t know or what we aren’t willing to know, can be what holds us back. These can be beliefs or values that we have always taken for granted as true and working to better our life. Believing that I couldn’t be a radio host, because I didn’t know how to produce a radio show, could have kept me from being on the radio and sharing the insights that inspire others. So often I have stopped myself because I didn’t know how something could happen. I didn’t know how to publish a book, and that happened, but only when I said, “Yes” to it. What if we don’t have to “know” how to do anything, before choosing it? And we could allow ourselves to indulge in the possibilities instead? Have you ever thought you are chained to the way your life currently is without even exploring what else you could BE that would allow you to experience life differently? Is it because it is comfortable, you know what to expect and it feels safe? Change is the essence of living, when we take risks to step out of our comfort shells, we truly begin to live the life that allows each of us to BE who we BE. Are you just settling for your life because it is comfortable? 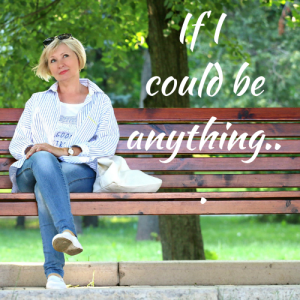 What if you asked this question- If I could BE anything what would I be? Being more potent in my presence- as I indulge in that possibility, I see myself as standing stronger with more confidence of who I am. I see myself as a strength that brings about change to the world, not by using force but rather by being who I truly BE. Being fully aware- this indulgence shows me that by being fully aware, I can stop reacting and begin asking questions about how best to respond. Being fully aware will assist me in knowing more of what is true and what isn’t. And I sense that is just the tip of the iceberg in being fully aware. Being kinder to myself, others and the planet- as I indulge in this possibility, I see myself offering more nurturance that allows all living things and people around me to grow into the greatness of their own presence. Being connected to my capacity to know and to access more knowing- as I indulge in this, I sense that I will be making more choices that contribute to my life as well as to those around me. Being my true joy- this indulgence fills my whole being with living fully and experiencing life in all its richness and beauty. Being grateful for everything in my life- this indulgence gives me awareness that everything can be a contribution that grows my awareness, knowing and consciousness. It allows me to choose my responses rather than reactions I later regret. And it goes on with more choices of what I can BE that will change my life. I keep it in my awareness and space of infinite choice that I can choose to BE anything in any moment as it will be what is needed in that moment to be the change that will make a difference. As you ask the question, what shows up for you as to what more can you BE that you haven’t been willing to be, AND if you were willing to be it, how would that change your life? Are you willing to indulge in the possibilities? If you are a parent, have you watched your child be willing to be whatever they choose? There is an age where they aren’t afraid to BE- risky, joyful, angry, happy, sad, whimsical, silly, whiny, proud, greedy, curious, kind, gentle, laughable, loving- and on and on. They are willing to be anything so that they can discover how to use those to make the changes that they desire. It isn’t that they are all appropriate, the key is that they are willing to BE it. How did that work for me? Did I have any other choices? How did my choice affect those around me? Was I reacting without consciously choosing? And these would be some of the same questions you can use with your children. You may also want to play with teaching your child how to indulge in what would happen if they stepped into the possibility of making that choice and get a sense of what that would create for them. This connects to the energy of future possibilities and how that resonates with us energetically rather than having to think our way through it. What connections are you building with the awareness they already perceive? Being You as you parent your children gives them permission to be all that they BE! Mary Dravis-Parrish, Author, Parent Whisperer and Host of Be You Parenting Radio show assists parents in knowing how to empower their children through the challenges of life.